Do you have a significant vision decrease from cataracts? Is your quality of life affected by poor vision? Are you experiencing any other eye related health issues? Cataract is a natural effect of aging. The eye's natural crystalline lens helps us focus on people and things at varying distances. Unfortunately, as we grow older this lens often stiffens and hardens, and without its youthful suppleness, it loses its ability to focus, creating vision problems. This condition a natural consequence of aging - is called presbyopia. As we age, these changes occurring to the natural crystalline lens can lead to the development of cataracts, or a loss in the clarity of the lens. Since the lens is no longer as flexible or as clear as it used to be, the eye can't focus light properly, causing a decrease in vision. "My husband had cataracts in both eyes. He can see again! We highly recommend Dr. Fite and his staff. Also, everyone at Tru Vista"
Measurements are taken in the office prior to cataract surgery to select the proper lens for your eye. Often times, these measurements can be difficult to obtain when the cataract is still present, or if your eye has had prior surgeries such as LASIK. 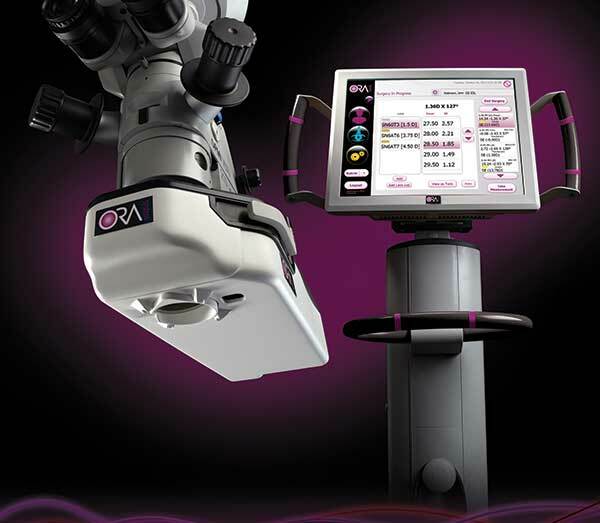 The ORA System® allows your surgeon to measure the eye for your new lens right in the operating room, after the cataract has been removed. This can improve accuracy, and provide better outcomes. If a lens to correct astigmatism is being used (Toric lens), the ORA System allows us to properly align the new lens over your vision for the best results. 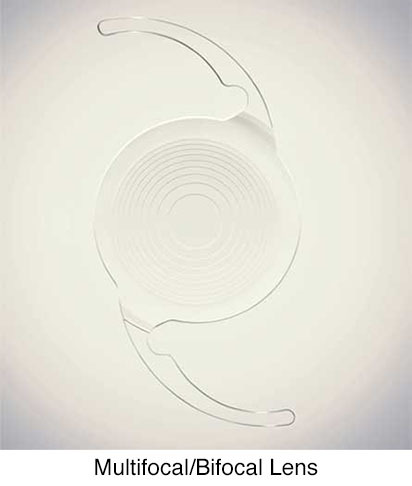 The ORA System® guides the use of these advanced technologies and allows Dr. Fite to ensure the IOL is perfectly selected and perfectly placed, which helps give you a better visual outcome. Use of the ORA System® during surgery is not covered by insurance and requires an additional out of pocket expense. 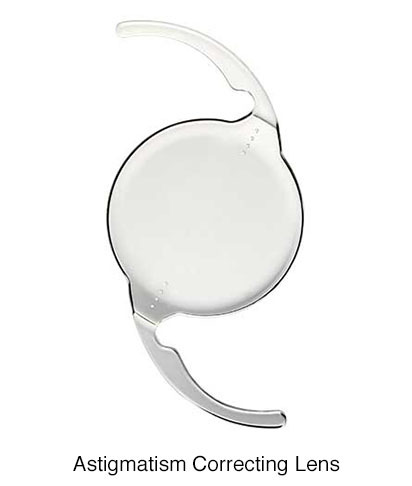 Use of the ORA System® is included in the cost of Multifocal/Bifocal and Astigmatism Correcting Lenses. The femtosecond laser (FS laser) is a medical tool the eye surgeon may use to perform some of the steps of cataract surgery. The eye surgeon uses the laser instead of a surgical blade and other tools. The laser makes a cut in the cornea (the front window of the eye). It is also used to make a circular opening in the outer layer of the cataract. It can help break up the cataract. It some cases, the use of the FS laser can make the cataract easier, and possibly safer to remove. 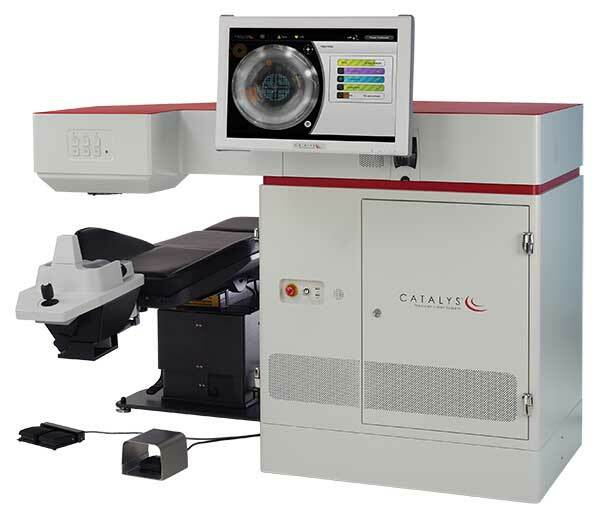 The FS laser can also treat astigmatism during the cataract surgery. Astigmatism causes blurry vision. Normally, eyes are round (like a baseball). With astigmatism, the eye is curved (like a football). Glasses can treat this. Or eye surgeons can treat astigmatism during cataract surgery by making a cut in the cornea to change its shape. This cut is called a relaxing incision. The FS laser can be used to make this incision. However, if you have larger amounts of astigmatism, you may require an astigmatism correcting lens as mentioned above. You have to pay extra for the user of the FS laser. Medicare and private insurance do not pay for this. 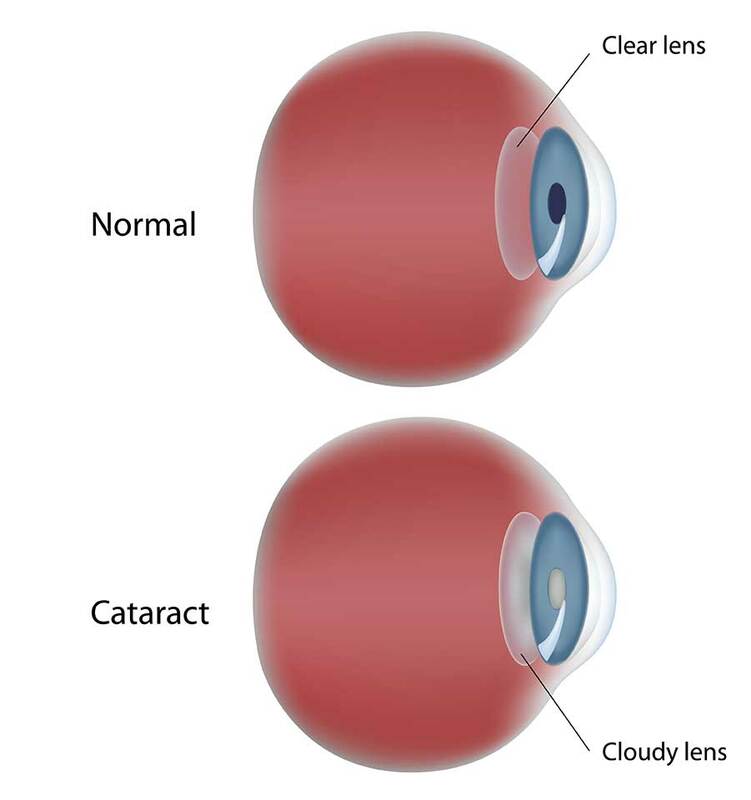 WHAT IS CATARACT SURGERY WITH CATALYS? Today's cataract surgery technology offers you the option to correct additional eye conditions, granting you the freedom to resume activities like knitting, golfing, cooking, driving and much more. Can correct cataracts and allow good distance vision. Does not correct near vision or astigmatism. Can correct cataracts and allow good near and distance vision, eliminating the need for glasses for many activities. Can correct cataracts as well as both astigmatism and distance vision (does not correct near vision). Can be satisfactory for cataract patients who don’t mind wearing glasses or contacts for everyday activities. If you'd like to treat your cataracts, but don't need or want to correct other vision problems, such as reading vision and astigmatism then a basic/single vision lens could be a good fit for you. Ideal for cataract patients who regularly use a computer, sew, watch TV, play golf or tennis, drive and more. Patients will need a good light source for reading. Patients who read for extended periods of time may need readers. Patients who are sensitive to glare may notice glare and halo's with night time driving. Most patients do not consider this a long term impairment. Ideal for cataract patients who wish to reduce the need for glasses and contacts for distance vision. Today's technology means you can correct both cataracts and astigmatism during cataract surgery. 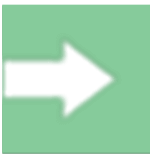 The astigmatism correcting lens does not correct near vision. The patient will still need to use readers for near activities such as reading and computer work. Medicare and private insurance typically cover Basic/Single Vision Lenses except for deductibles and copays. 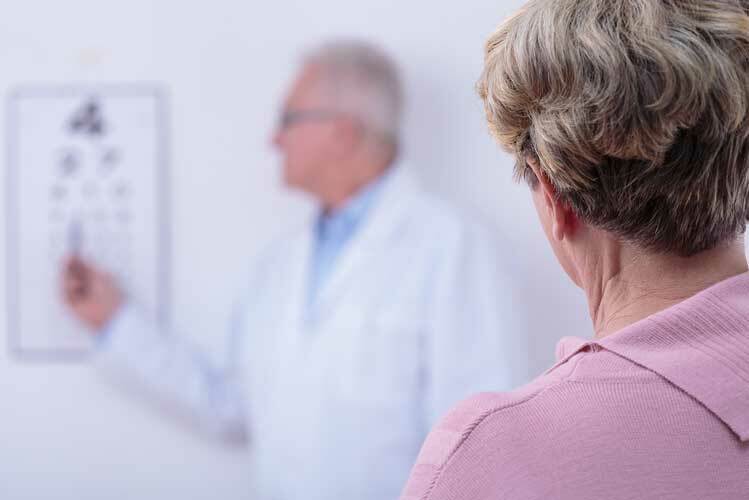 Medicare and private insurance typically cover the cost of basic cataract surgery except for deductibles and copays; there will be an out-of-pocket expense for astigmatism correcting lenses. 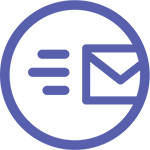 Get the help you need and request an appointment with us today! 1. WHEN IS THE BEST TIME TO TREAT CATARACTS? Many people believe cataracts have to be "ripe" before they can be removed. This is simply not true. Cataract surgery is a routine procedure that can be performed as soon as your vision problems begin to interfere with your life. 2. What happens if cataracts go untreated? Over time, the clouded areas of your lens can become larger and denser, causing your sight to become worse. This can take anywhere from a few months to many years. Eventually, though, your entire lens can cloud over and cause blindness. 3. Which lens will work best for me? No single lens is right for everyone, your doctor will help you determine the most appropriate option for you. 4. Do all lenses let you see at different distances? No, only lenses with multiple focal points are designed to give you a full range of clear vision. For instance, the multifocal/bifocal lens is designed to perform near, far and everywhere in between, so you can experience crisp vision for the most important things in your life, like reading, driving and outdoor activities. 5. Will they treat both eyes at the same time? No. Your Surgeon will only treat one eye per procedure, allowing your eye adequate time to recover and stabilize before treating the other. Stabilization usually takes several weeks. 6. Can cataracts come back? Once a cataract has been removed, it cannot return. However, over time, a small percentage of patients may notice that their vision has once again become cloudy. This condition is known as a secondary cataract, and it can be easily treated by a laser procedure performed in our office. 7. How successful is cataract surgery? Cataract surgery has an overall success rate of more than 98%, making it one of the most successful procedures performed today. FITE EYE CENTER IS A WELL KNOWN CATARACT SURGERY AND TREATMENT CENTER WITH RENOWNED CATARACT SURGEONS AND LOCATIONS IN BOTH CLINTON TWP., AND ROMEO MICHIGAN.